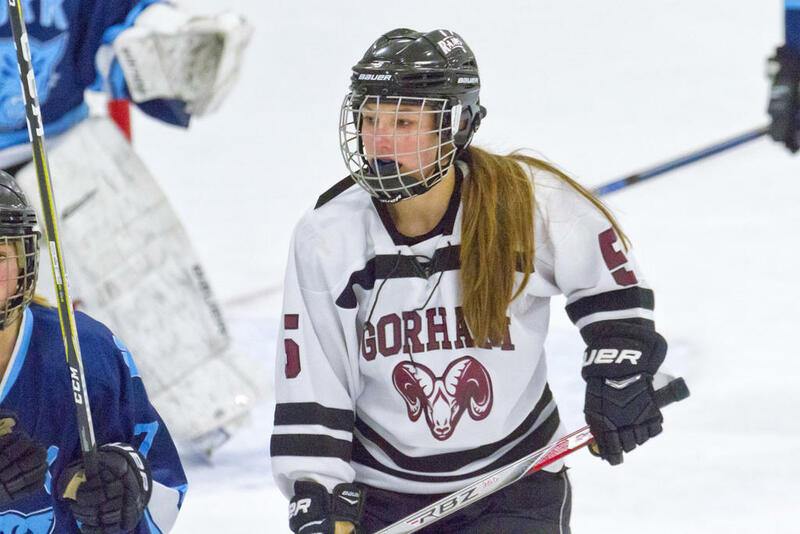 GORHAM—The Rams hopped out front of the visiting Wildcats early on Monday afternoon, Jan. 21, thanks to an opening-minutes goal by CC Cochran. The home team even held the attacking edge throughout the contest, often pressuring and ultimately putting up more shots than their guests. But the Rams couldn’t finish: The Wildcats surged back with a pair of rapid-fire goals to take the lead and capped the day with a third strike. The Rams kicked off the action with a notch just 2:17 into the first: Isis Adams assisted Cochran in punching the 1-0 tally past Wildcats keeper Erin Gray. Four and a half minutes later, Adams nearly nabbed a second notch, sliding right-to-left through the Wildcats’ slot and whipping off a backhand shot towards the right post. Adams’s try bounced out, though, and the scoreboard remained stuck at 1-0. Not long after, Cochran picked up two minutes for interference; they were just two minutes in a heavily penalized outing, but the Wildcats took advantage of them: Jill Carr shoveled the tying goal past Rams netminder Izzy Wareham for 1-1. Back at even-strength, the visitors then wasted little time hashing the go-ahead tally: Ashley Carney assisted Sophia Santamaria in making it 2-1. The Rams badgered their guests throughout the contest, but couldn’t convert a second time. As Germond noted, Rathbun had a great one-on-one opportunity midway through the second, for instance, but Gray turned her away; shortly thereafter Cochran fired off a nice shot from the left point, but again Gray proved good for the stop. Rathbun earned a second one-on-one toward the end of the stretch, but her backhand attempt from the right side didn’t do the trick. The Rams also had a couple five-on-three powerplay chances over the course of the game; they didn’t look at their sharpest on the first of those, and the second didn’t last long – they picked up their own penalty to turn it into a five-on-four. Two minutes into the third, Santamaria hopped out of the penalty box and directly into the fray; she picked up the puck and dashed forward, needing only seconds to beat Wareham for the Wildcats’ third goal of the day. That, of course, is where the score ultimately settled out. A victory over the Wildcats would’ve been a healthy Heal-Points grab for the Rams, now 3-11-1 and sitting in sixth place – the last place that earns entry into the postseason. Portland/Deering, in seventh at 3-10-0, nips at their heels. The Rams face off with Yarmouth/Freeport on Saturday the 26th. Sarah Juskiewicz tracks the action following a faceoff. Carson Battaglia shoots up-ice for the Rams. CC Cochran picked up the Rams’ lone goal vs. the Wildcats, early in the contest. Anna Nault cuts through the corner. Isis Adams goes shoulder-to-shoulder with a Wildcats opponent. Izzy Wareham turned in some excellent saves for the Rams, despite their eventual loss.